By Dan Ambrose: Golden Boy Promotions President Oscar De La Hoya is saying that former WBA/WBC 154 pound champion Saul “Canelo” Alvarez (44-1-1, 31 KOs) is interested in facing WBA middleweight champion Gennady Golovkin, and that he’s not afraid of fighting him. De La Hoya says that the red-haired Canelo isn’t afraid of fighting anyone. De La Hoya doesn’t appear to be ready to press the button to make the Canelo-Golovkin fight happen just yet. He wants to match Canelo against WBC middleweight champion Miguel Cotto next in early 2015, because he feels that’s the biggest fight in boxing right now. I’d be very surprised if De La Hoya makes the Canelo-Golovkin fight even if Canelo beats Cotto. If De La Hoya makes the Canelo vs. Golovkin fight right away after what will likely be a grueling fight against Cotto, we could see Canelo get quickly annihilated by Golovkin in 2 or 3 rounds. You have to remember that Golovkin hasn’t taken any punishment in any of his fights, and he’ll likely breeze through his next title defense against the light hitting Martin Murray next February. In the meantime, Canelo will need to battle hard to beat Cotto. 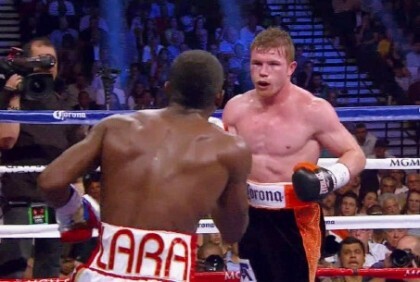 That’s a fight where Canelo is probably going to take a substantial amount of punishment no matter who wins that fight. De La Hoya will need to make a decision if Canelo beats Cotto whether it might be better for Canelo to vacate the WBC 160 pound title rather than putting him in with Golovkin, and watching him get chopped to pieces slowly. Canelo would have his hands full even if he was fresh for a Golovkin fight, but he’s going to be in for a world of hurt if he takes that fight immediately after the Cotto fight. De La Hoya will likely steer Canelo around Golovkin in 2015. If the fight does take place, it’ll likely be in 2016. By then, Golovkin, now 32, will be a little bit older, and perhaps old enough for Canelo to beat him.